A paper published today in Advances in Space Research corroborates the cosmic-ray theory of climate and "proves that cosmic rays play an essential role in climate change and main part of climate variations can be explained by [the] mechanism of action of CRs [Cosmic Rays] modulated by the solar activity on the state of lower atmosphere and meteorological parameters." "We demonstrate that the detrended annual means of global surface air temperature in 1965–2012 show the maxima during CRs [Cosmic Rays] and Dst index [of the solar wind] minima. 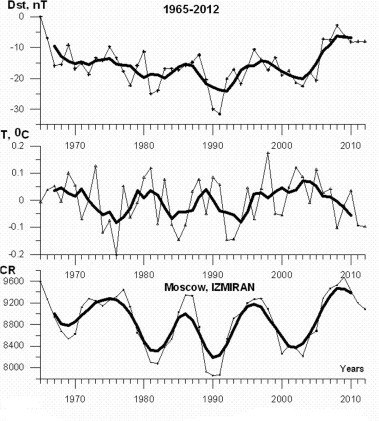 It proves that CRs [Cosmic Rays] play essential role in climate change and main part of climate variations can be explained by Pudovkin and Raspopov’s (1992) mechanism of action CRs [Cosmic Rays] modulated by the solar activity on the state of lower atmosphere and meteorological parameters. Following this we have to seek for another ways of looking for global warming reason, first of all, as a man impact on climate." Top graph shows changes in cosmic rays correlated to detrended surface temperatures in second graph. Note vertical axis is inverse on the temperature graph because increased cosmic rays are believed to seed cloud formation, which causes cooling. Bottom graph shows sunspot numbers and 3rd graph is an index of solar geomagnetic activity. Cosmic Rays [CR] are believe to seed cloud formation and thus inversely related to temperature as bottom two graphs show. We previously calculated using the greenhouse equation that a mere 1% change in global cloud cover up or down would change average global surface temperature ~1C, thus if clouds are indeed seeded by cosmic rays, and cosmic rays vary up to 8% over solar cycles (as shown in the first graph above), this theoretically could have a significant effect on local and global temperatures. We have studied conditions in interplanetary space, which can have an influence on galactic cosmic ray (CR) and climate change. 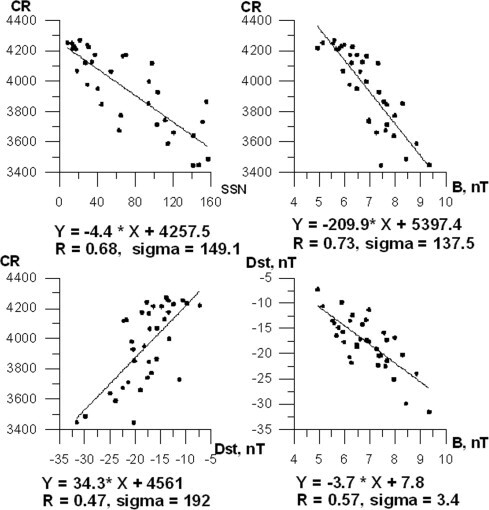 In this connection the solar wind and interplanetary magnetic field parameters and cosmic ray variations have been compared with geomagnetic activity represented by the equatorial Dst index from the beginning 1965 to the end of 2012. Dst index is commonly used as the solar wind–magnetosphere–ionosphere interaction characteristic. The important drivers in interplanetary medium which have effect on cosmic rays as CMEs (coronal mass ejections) and CIRs (corotating interaction regions) undergo very strong changes during their propagation to the Earth. Because of this CMEs, coronal holes and the solar spot numbers (SSN) do not adequately reflect peculiarities concerned with the solar wind arrival to 1 AU. Therefore, the geomagnetic indices have some inestimable advantage as continuous series other the irregular solar wind measurements. We have compared the yearly average variations of Dst index and the solar wind parameters with cosmic ray data from Moscow, Climax, and Haleakala neutron monitors during the solar cycles 20–23. 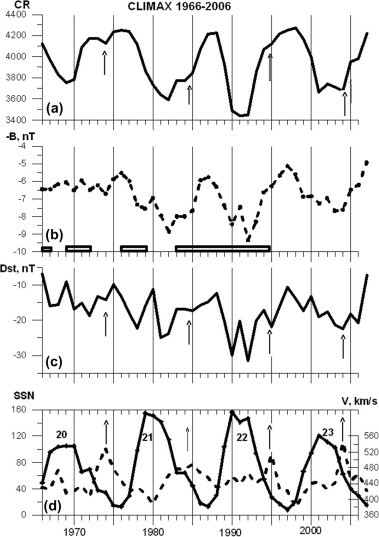 The descending phases of these solar cycles (CSs) had the long-lasting solar wind high speed streams occurred frequently and were the primary contributors to the recurrent Dst variations. They also had effects on cosmic rays variations. 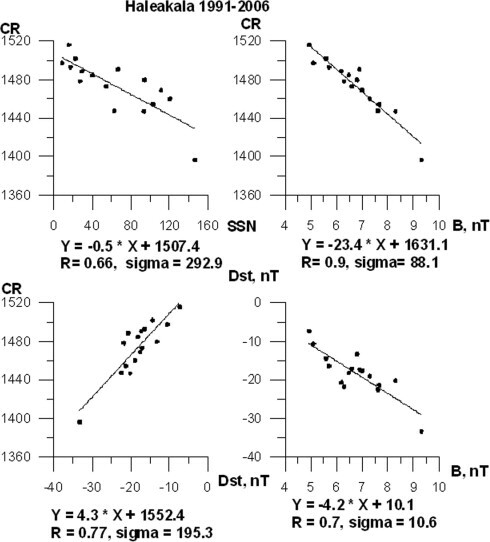 We show that long-term Dst variations in these solar cycles were correlated with the cosmic ray count rate and can be used for study of CR variations. Global temperature variations in connection with evolution of Dst index and CR variations is discussed. Although cosmic ray amounts do correlate with thermal changes on Earth I think it more likely that they are merely a proxy for other aspects of solar variation that have a more direct influence as I have explained elsewhere. As I pointed out well over three years ago, there is compelling correlation between climate and the inverted plot of the scalar sum of the angular momentum of the Sun and all the planets. This paper outlines the same reasons that I described back then, relating to magnetic fields and cosmic rays. It is very important that determine the role of cosmic rays in the distribution of ozone over the polar circle and the formation of waves in the stratosphere (sudden warming) in the winter. This determines the position of the polar vortex and its velocity, and consequently the circulation in the troposphere. I think that 8% of the variation of GCR is a lot for the climate. Important is also the duration of elevated radiation of galactic, which is evident throughout the entire cycle 24 of a large increase in 2006.